1/10th Scale Rear Buggy wings, 1 pr. Here is Precision R/C's 2nd product, a new 1/10th Scale Buggy wings for 2wd and 4wd buggies. Incl..
Protech Body, Orig RC10 Buggy, Clear Fits: Team Associated RC10 RC10WC .. Here is Precision R/C's first product, a new Buggy Body for the Team Associated RC10B6 and RC10B6D. 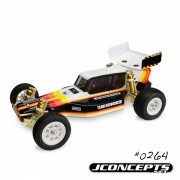 ..
JConcepts, out to Silence the competition, debuts new Silencer body design for Team Asso.. Body, Bandit, Rock n' Roll (painted, decals applied)..